Dubai: Nuakhai, the harvesting festival of Western Odisha, was celebrated in a Grand scale in UAE at the Indian Consulate, Dubai auditorium on 26th August. This is the fourth consecutive year of celebration of this agrarian festival in UAE and this year it is unique because it was celebrated on the actual day of Nuakhai for the first time. In spite of living far away from their motherland, the community has never forgotten their traditions and has taken every effort to showcase their cultural talent & celebrated the festival in an authentic manner. Authentic cuisine, rituals and celebration were followed as it happens back home in Western Odisha which gave a feeling of being at home to all present, even if staying in UAE. The celebration began at around 4 O’clock in the evening. Initially there were few competitions among the kids like drawing, paragraph writing etc. on the theme of Nuakhai or about Western Odisha which gave them an opportunity to explore and know more about their motherland. Later “Nua Dhan” was offered by the elders to Maa Samalei with a SAMALEI VANDANA, who then distributed to all. 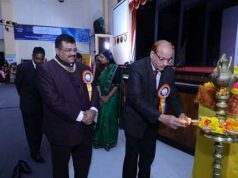 Thereafter cultural programs followed which included electric performance by the participants and audience. There were Sambalpuri Dances, songs, drama and fashion show by ladies. Enthusiastic children & their excited parents in their Sambalpuri handloom attire made the ambience felt more authentic and the spirit of celebration was untiring. 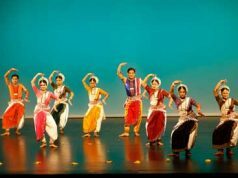 More than 60 performers which included children, ladies and gents participated in dancing, singing and various other interesting activities. The air was full of festive mood and a sense of belongingness, a home far away from native home. 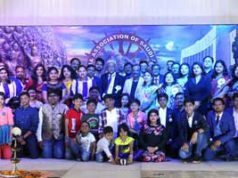 Consul Prem Chand of Indian Consulate, Dubai with his wife graced the occasion as the chief guest and was very happy to see the authentic celebration with various cultural programs which kept him engrossed. He inaugurated the function with the lighting of lamp and addressed the community with a brief about Nuakhai. With a gathering of more than two hundred plus people residing in UAE it was one of the largest Nuakhai gatherings, in spite of the day being a working day for many. The enthusiasm was quite visible among the attendees. Celebrating the festival on the same day of actual Nuakhai made people to connect to their families back home and took them down their memory lane. To commemorate the celebration, a desktop calendar depicting the great personalities of Western Odisha was unveiled. Also a poetry book of Sambalpuri poems “Matir Surta” (Composed by a local Talent) was unveiled by the honorable chief guest Consul Prem Chand. The program continued till about 10PM with an authentic, traditional & sumptuous dinner consisting of dishes like Ambila & Khatta with Kardi & Hendua, Ghanta Curry with white Channa, Pitha, Mada, Ras bara (sweet dishes) etc. These were served in the traditional way in plates and bowls made out of leaves and called “Khali Dana” in Odia. Everyone sat on the floor and had their dinner in ‘Khali Dana’. People not only from Odisha but outside states were also among the guests who appreciated the tasty Odia food, the rituals based on agriculture and various cultural programs.